“This situation shows that legislative measures have a positive impact, but the slowness in the implementation of those measures, prevents the decrease of piracy to be dramatic as in other countries of our environment, which are achieving amazing results with similar laws. The entry into force of the reform of the Intellectual Property Law, on the 2nd March 2019, represents an only and strategic opportunity to a great leap forward into a successful model to fight against piracy in our country. We need the Public Administration to allocate more resources and speed up the procedures, focusing in blocking these sites of illegal content, a measure not only specially supported by consumers, but that it has been proved to be the most efficient in other countries. Besides, it should encourage and support unequivocally self-regulation codes. 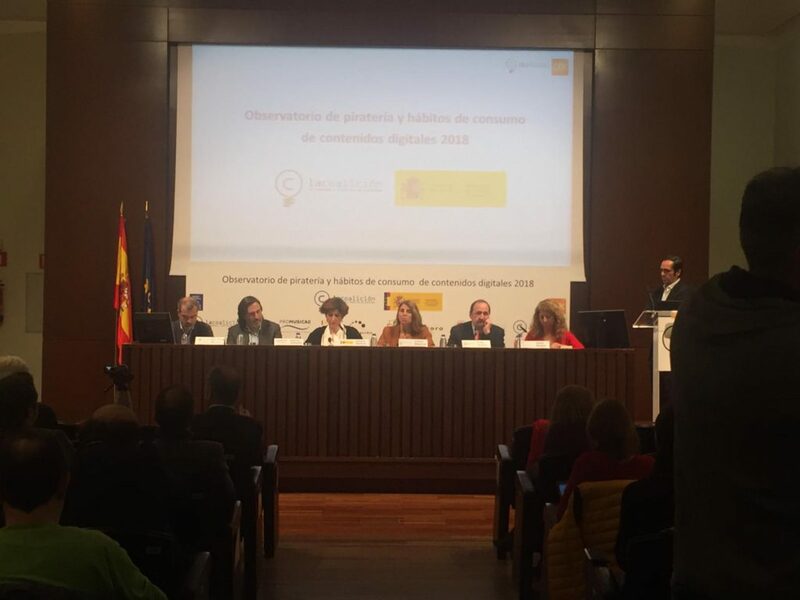 It is urgent and needed to consolidate the trend, and reverse the damage caused by piracy to creators and to industries, also to employment, to the Public Purse and competitiveness in our country”, stated Carlota Navarrete, Director of the Coalition. The survey has included, for the fifth consecutive year, data regarding the impact of piracy on television series and football matches broadcasts as well as the income sources of websites offering pirate content, for the first time, we have segmented illegal accesses into editorial contents in books, press and music sheets. Percentage of people accessing illicitly to content is segmented as follows: music (29%), films (32%), videogames (12%), books (24%), series (29%), football (11%), Press (10%) and Scores (2%). More than 50% of consumers who access to illegal contents argue they do not distinguish between legal and illegal internet platforms. Besides, among the reasons they argue they have underlined the fact that “access is fast and easy”, (51% compared to 43% last year) and “the lack of legal consequences” (31% compared to 25%), these have been the grounds where percentage has increased more during last year. It also gains support the reason “I’m not going to pay for a content that I won’t possibly like later” (43% compared to 41%). It increases the weight of reasons like “because I need urgent access to releases and I don’t want or don’t like to wait to have it legally and “I am not doing any harm”, with 28% of users in both cases. 70% of users hiring an Internet connection consider mainly the access speed that enables faster access to content, which represents two percentage points more than in 2017. It has also been increased the percentage of users who especially value the combined offer (ADSL Packs or fibre plus contents), when choosing the internet access provider, which represents today 58% (compared to 56% in 2017 and 51% in 2016 respectively). Regarding the ways to access, it has been significantly reduced the weight of search engines as the access way to pirate contents, which has decreased up to 60% compared to 79% registered in 2017. Google is still being the most used search engine; in any case, nine out of ten accesses to pirate content are a result of searches in Google. Proportionally to the decrease in the use of search engines as a way to access to pirated contents the use of applications for tablets and smart mobile phones (22% compared to 17% in 2017) has increased, also the use of social media has been doubled (21% compared to 10% in the previous year), being the most used Facebook and YouTube (56% and 43%), closely followed by WhatsApp and Twitter (29% both). It also increases the online streaming (17% compared to 14%) while online direct downloads still maintained 29%. The percentage of webs from which illegal contents were accessed and which are financed by advertising continues to exceed 90%, as in previous years. From such publicity, 50% corresponds to online gaming and betting sites, 36% to dating sites and 28% to anonymization systems (VPN, proxies, etc.). Nine out of ten users have been requested to accept cookies; two out of ten has paid to download content or has been requested to fill in an opinion survey to do so. On the other hand, publicity has significantly been reduced in pirate web sites corresponding to consumer products of renowned brands of food, fashion, insurances, telephony, etc. (24% compared to 26% in 2017). Sources of income of these sites are diverse, and it is particularly to be highlighted than more than a third of consumers (66%) had to sign up as users, transferring personal data that pirated gather illegally in databases, which are after used for e-marketing campaigns and reach very high prices in the market. Pirate sites also get much more valuable data that one could a priori imagine, allowing them to get important economic benefits, e.g. those referring to Internet surfing habits, rest of websites visited by consumers, preferences, likes, purchase habits, etc. Likewise, means of payment play a significant role in the running of the pirate site, especially in the cases in which those sites commercialize premium accounts, get donations or standardise a system to send mobile messages to registered users to inform of the release of new content on the web site. Users that have ever paid for the content they have downloaded from these web sites are already 22% (compared to 14% in 2017, 11% in 2016, 9% in 2015 and only 5% in 2014). After a significant increase during five consecutive years we can state the direct payment for pirate content is more than trendy, it is a reality each time more consolidated, what requires efficient measures. The impact of digital piracy on employment provides disturbing figures. Creators, and cultural and digital content industries, a sector that nowadays directly employs 83,925 people could, in a scenario without piracy, allow the creation of 21,877 new direct jobs, which would represent an increase of 26% and around 109,385 more indirect jobs. The Public Purse failed to receive because of piracy, almost 419 million euros of VAT and more than 50 million euros in Personal Income Tax, while the collected amount loss in social security contributions was of almost of 169 million euros. That is to say, in 2018 Public Funds stopped receiving 638 million euros because of the illegal access to contents, summing up an accumulated amount since 2012, of 3,985 million euros. During 2018, 1,983 million music contents were illicitly accessed, with a market value of 7,308 million euros. (536 million euros in damage). It decreased the number of consumers who accessed to illegal contents, from 34% in 2017 to 29% in 2018, if we take into account the same type of accesses and it has been increased the number of consumers who access to music legally. 68% of those accesses belong to contents with less than a year old since their commercial release (48% in 2017). The volume of films accessed illegally during 2018 was 701 million, with a market value of 5,696 million euros compared to 5,725 million euros in 2017. (471 million in damage). It has slightly decreased the number of consumers who accessed to illegal contents, from 33% in 2017 to 32% in 2018 and the legal consumption has been increased in 12%. 55% of the accesses were produced when the film was still shown in commercial cinemas compared to 58% in 2017. 29% users access illicitly to Tv series, summing up 898 million episodes illegally played or downloaded during 2018, showing a decrease compared to 2017, where the number of downloaded accesses was of 945 million, with a value in the market of 1,382 million euros (167 million in damage). The legal consumption of Tv series has increased 13%. 62% of accesses series took place during the broadcast period in TV (75% in 2017). In 2018, 425 million illegal accesses to books on the Internet were accounted, with a market value of 3,656 million euros (215 million in damage). The number of consumers accessing to illegal contents was of 24%., is maintained with reference to 2017 but in 2018 it increases the number of consumers who digitally access legally to books. More than the 42% of accesses corresponded to less than one-year-old contents (41% in 2017). Regarding video games, during 2018 there were 234 million illegal accesses. These products’ value reached 5,479 million euros, (265 million in damage). Decrease in number of video games’ downloads from 241 million in 2017 to 234 million in 2018 and the legal consumption of video games increases 3%. 62% of illegally accessed video games were in the market for less than a year (62% in 2017). During 2018, 107 million football matches were watched illegally in 11% of Spanish households, with a market value of 398 million euros, (269 in damage). The number of illegally watched football matches decreases compared to 2017, when there were 113 million football matches watched, but the number of consumers who legally access to legal internet portals has increased. In 2018, 10% users have illegally accessed to newspapers and magazines, illegally downloading 227 million contents, the value of these downloads reached to 325 million euros (247 million in damage). The illegal consumption of press in digital format (10%) is higher than the legal consumption (3%). In 2018, 18 million music sheets have been illegally downloaded, with a market value of 245 million euros (18 million in damage). The illegal consumption of music sheets is higher than the legal one. Most efficient measures against piracy would be, to the internet user’s own view, blocking accesses to the web site offering content (75%) and penalising Internet providers (71%). Following these two, the best measures to reduce infringements, according to consumers, would be promoting social awareness campaigns against piracy (59%) and imposing fines to users (54%). This information supports that the majority of consumers see very positively a better collaboration framework between the sector of contents and the service providers, and that the self-regulation codes could be the next step to complete a set of tools to stop fraud and illegal access to contents. *New types of illegal access have been measured in 2018 as digital content piracy is a living phenomenon that needs to be adapted to new realities in order for its study and quantification to be rigorous, for this reason, to have a reliable comparative have gone back its traceability to 2017 allowing the universes of study to be identical, which is an indisputable improvement since already in 2018 we are in a position to offer consolidated data.